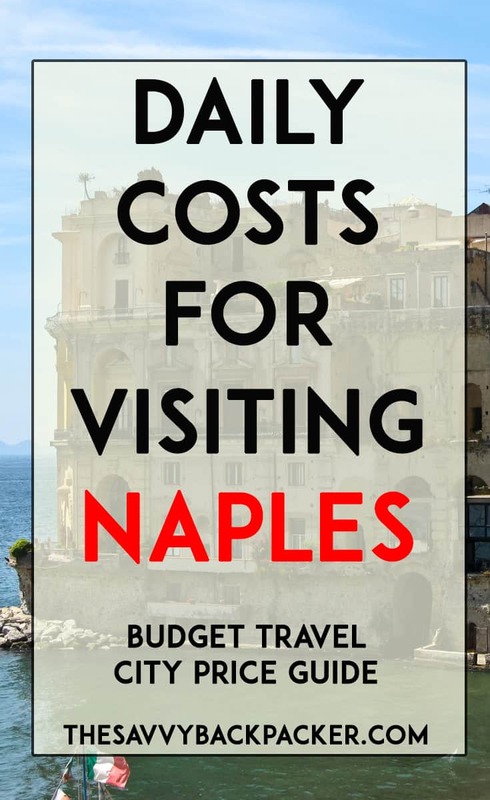 The daily travel costs to visit Naples, Italy. How to estimate your budget for food, hostels, hotels, attractions, alcohol & more. It’s said that Rome is Italy’s heart and Naples is its soul. 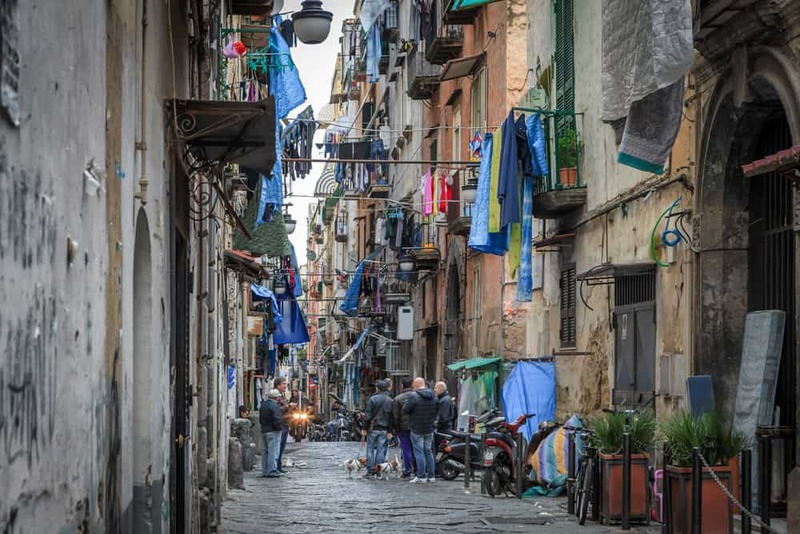 And maybe this soul comes from the fact that Naples is one of Europe’s poorer cities. It also gets the reputation of being dirty, rough around the edges, and a bit seedy thanks to its strong presence of organized crime. But it’s also cheap and has its own charming character. If nothing else, it serves as a home base for people wanting to visit Pompeii and eat great pizza. 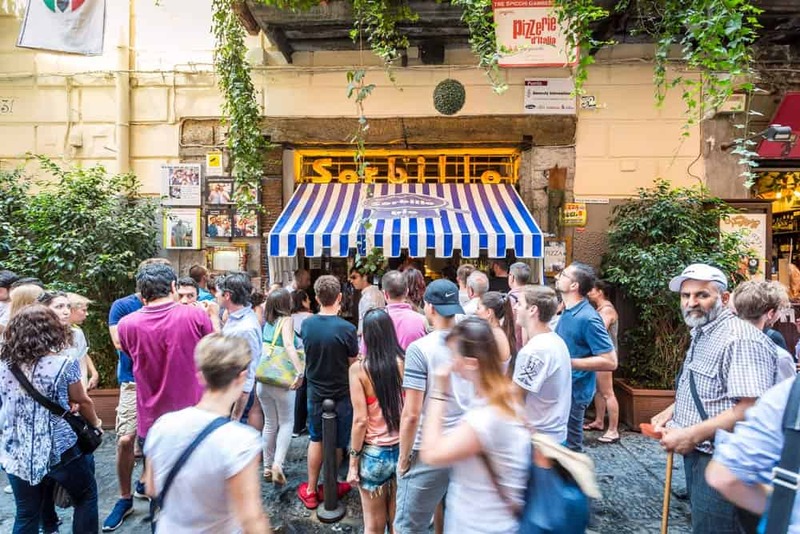 In this Naples travel price guide, we’ve outlined the estimated travel expenses for food, accommodation, attractions, alcohol, and other things that you’ll experience when you visit this gritty Italian city. In addition to walking tours, consider an excursion to Pompeii and Mount Vesuvius. From Naples, it will cost €60-€120 for a day trip. Naples’ cuisine heavily incorporates seafood, fresh mozzarella, and pasta. The city is known for its Margherita pizzas, which are available throughout the city. Sweets from stands and cafés are popular, especially baba (liqueur-soaked rum cake) and gelato. Cheap dining options abound in the city: look for cafés, pizzerias, and take-away for inexpensive meal options. Prices are affordable, and they can be downright cheap if you leave the tourist zones. Read more of our strategies for Eating and Drinking in Europe on a Budget. Many hostels will offer a free simple breakfast of that normally consists of cereal, bread/croissant, and maybe milk, coffee, tea, or juice (some hostels will offer more and some less). Hotel breakfasts tend to be overpriced, so skip those in most cases. Antico Forno delle Sfogliatelle Calde Fratelli Attanasio: The best sfogliatella in Naples. This bakery is super popular with locals and everyone else who visits Naples. La Sfogliatella Mary: Another great spot for sfogliatella. Pasticceria Poppella: More amazing traditional pastries. Bar Salvo: The place to go for cornetto (the Italian version of a croissant). Bar Mexico: Excellent coffee/espresso and a range of pastries. Centrale del Caffe: Cute cafe with great coffee. Margherita pizzas run €3-€7. Pay attention to find a pizzeria with a ‘Vera Pizza’ sign; it means the restaurant has met the legal specifications for authentic Neopolitan pizza. Pubs and burger joints offer basic meals for €3-€8. Look for ethnic and vegetarian options for cheap eats, €2.50-€7. O Grin is a popular, cheap, and vegetarian restaurant. Take-away and fast food run €3-€7 for a meal; Decumano 31 is a popular local favorite offering. 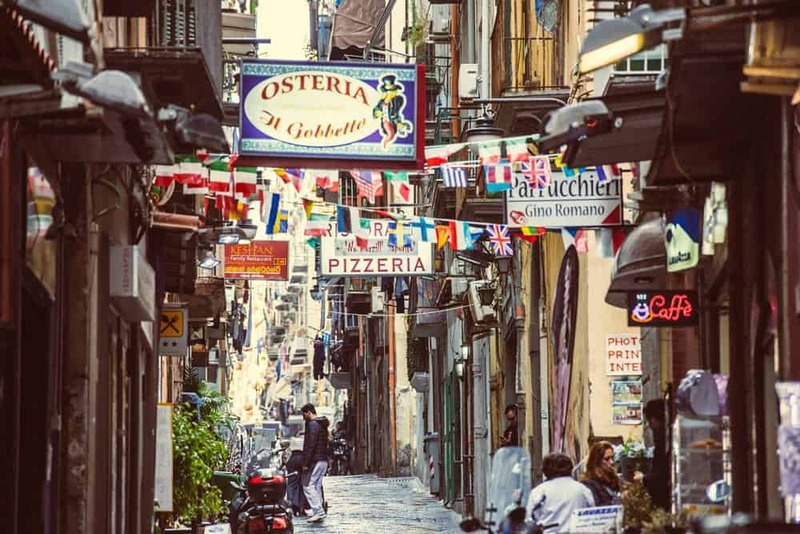 Trattorias and osterias are informal restaurants located throughout Naples and offer traditional food without a huge bill. Ristorantes are more formal dining, with meals costing upwards of €18. 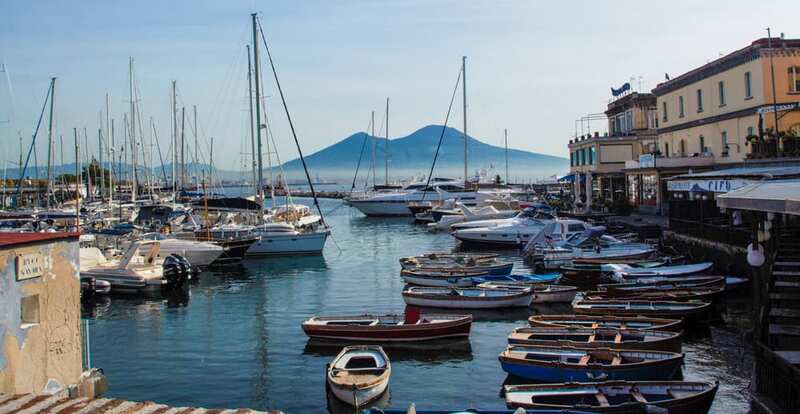 Look for fixed-price menus, ranging €12-€20 for 3-4 courses of traditional Napoli cuisine. Linguine ai Frutti de Mare (linguine and seafood) will run €8-€13 at a traditional sit-down restaurant. Trattoria Don Vincenzo: Affordable seafood and other local dishes. Anonymous Trattoria Gourmet: Friendly and unassuming restaurant serving local dishes. Trattoria Da Papa’: Excellent homemade Italian food. 400gradi Di Ciro & Salvio Rapuano: More great pizza. Insolito La Pizzeria Gourmet: And more pizza. Trattoria Pizzeria Nardones: Yes, more pizza. De’ figliole: Pizza… but it’s deep-fried! A’ Cucina Ra Casa Mia: Affordable homemade Itilain dishes. ‘O Grin: Takeaway vegan food. Public transportation in Naples consists of a bus, a metro, a tram system, and a small number of funiculars. Unico Compania is the ticket administration system, as each leg of transit is managed by a separate company. Tickets are available to travel within Naples and between surrounding towns and are sold at automated ticket stands in the transit stations. Ferry trips out to the Roman Ruins or Mount Vesuvius run €8-€15, depending on port and ferry company. Accommodation prices in Naples are pretty reasonable. There are only a handful of hostels in Naples, so that keeps prices up a bit, but they’re still fairly affordable. Airbnb is also popular, so that’s a good option if you want a little more space and privacy. Naples doesn’t have a ton of hostels but they have a few really nice ones. You should budget about 20€/night per person for a decent hostel — although many hostels raise their prices on the weekend. Remember, these prices are for a bed in a shared dorm room. If you want a private room, expect to pay €40-€60 total (for two people). Check out the latest hostel prices at Hostelworld. A decent budget hotel that is in the city center will cost around €80-€100/night. You can find cheaper hotels if you want to stay farther away from the center of the city or if you don’t mind staying in a junky place. You’ll find quite a few apartment rentals in Naples. They can be a good option for large groups or travelers who want a little more space (and a kitchen). On the other hand, you may also have to deal with inconvenient check-in processes and things like extra cleaning fees and service charges. For short stays, we prefer hotels/hostels but rental apartments can be a nice option for longer stays.